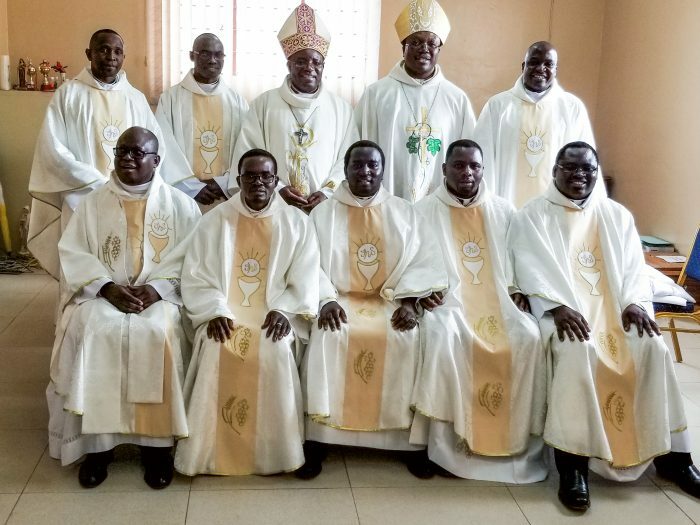 Seven newly ordained Zambian Oblates: Benny Lipalata, Bright Kachigamba Phiri, Morgan Musukuma, Elvis Ngosa, Godfrey Mwanza, Felix Bwalya Nyambe, Mathews Zulu! 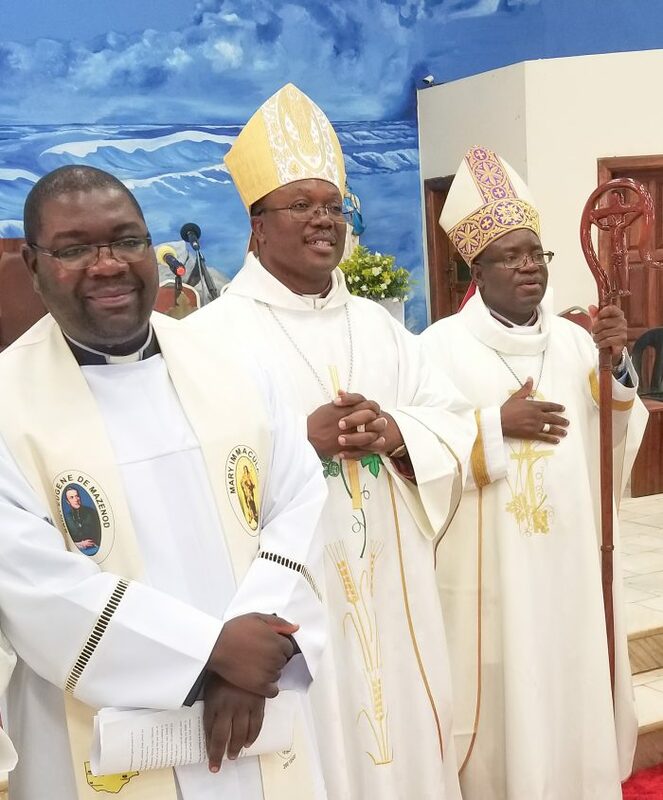 On Saturday, July 7, along with numerous Oblates, some diocesan priests and representatives from other religious communities, I was very happy to concelebrate the ordination Mass, presided at by Bishop Evans Chinyemba, OMI, bishop of Mongu Diocese. Bishop Valentine Kalumba, OMI, bishop of Livingstone Diocese, also concelebrated. The four-and-a-half-hour ceremony was filled with beautiful Zambian singing and dancing. As examples of the uniqueness of the ceremony, the Scriptures were brought up by a small girl sitting in a miniature Losi boat carried by four attendants, and at the offertory along with the customary offerings, gifts of a live goat, a chicken, and other items were brought to the altar. Frs. Benny, Bright, Morgan, Elvis, Godfrey, Felix, and Mathews come from various parts of Zambia. I got to know most of them during the year and a half I spent in Zambia living at the pre-novitiate house. 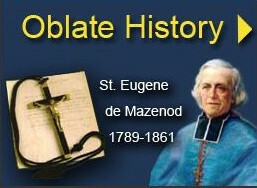 Several made their novitiate in Godfrey. Others made theirs in South Africa and Namibia. Their scholasticate years of Philosophy and Theology were also quite diverse: United States, Cameroun, Cedara, Rome, Kinshasa. They bring a wealth of international experiences, especially within the African context. Fr. 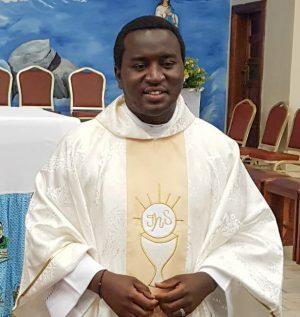 Felix Nyambe is a recent graduate of Oblate School of Theology in San Antonio. At the conclusion of the ordination ceremony, Fr. Vincent Sakala, OMI, Superior of the Zambian Delegation, announced the assignments of the newly ordained. 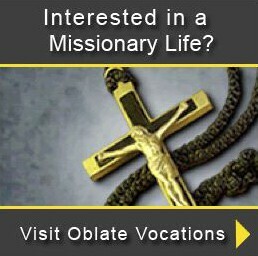 Most of them are being assigned to the existing Oblate missions: Kalabo, Lukulu, Livingstone, Shang’ombo. Fr. Morgan Musukuma is being assigned to Peru, after a year of preparation in Zambia. Elvis Ngosa is being assigned to the U.S. Province at the National Shrine of Our Lady of the Snows. His arrival will be determined by the time needed to satisfy the legal requirements for entry into the United States. The U.S. Province has already been blessed with the assignment of several other Zambian Oblates. The Zambian delegation has been very generous in sharing Oblates in various parts of the Oblate Congregation. When the Zambian delegation first started the custom of sending seminarians outside Zambia, especially to the United States, some objected that upon completion of their studies they might not “fit in” when they returned to Zambia. Over the years, that fear undoubtedly has been dispelled. 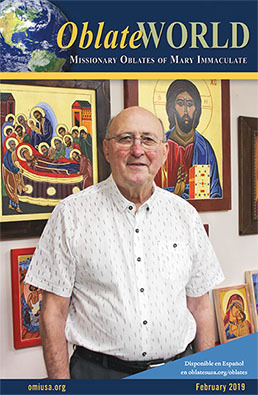 Zambians returning home have been a wonderful example of using their talents and education in some of the most difficult ministries which the Oblates serve. They have not hesitated to provide solid leadership within the Zambian context and elsewhere. May these newly ordained Oblates be abundantly blessed, as they assume their responsibilities and their new assignments in very challenging missions!